Remember when we told you that the fourth episode of Telltale's Game of Thrones is "coming soon?" You should, it was only four days ago. Anyway, now we now that "soon" means May 26, and there's a trailer. It doesn't look like the Forrester's situation is getting a whole lot better in Sons of Winter. Gared must leave Castle Black to venture beyond the Wall, Mira is caught up in political intrigue and scheming at King's Landing, Asher is sneaking around inside the slave city of Meereen, and Ryon is still a prisoner. Just another day at the Westerosi office, in other words. 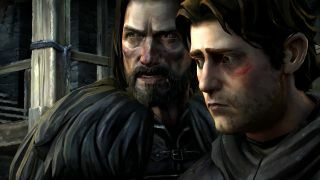 Game of Thrones: Sons of Winter, the fourth of six episodes, comes out on May 26, which I may have already mentioned. In the meantime, catch up with what's already happened, and what we thought of it, in our reviews of the previous three chapters: Iron From Ice, The Lost Lords, and The Sword in the Darkness.